With the array of supplements available nowadays it’s easy to get a bit confused as to what you really need as opposed to following the latest trend. Obviously, individual needs vary and depend on your goals, physical and mental health and overall well-being. It’s always best to do your homework and understand why you want to supplement with something and not just “follow the crowd”. As I always say, “Knowledge is Power” so get ready to become powerful because we’re dishing the details on the hottest supplement right now: Amino acids, BCAA’s and the science behind them. Are they really everything they’re made out to be? Is it all just hype? You’ve probably heard that “amino acids are the building blocks of protein” but what does that mean exactly? Protein is composed of long chains of amino acids stuck together that fold and form what are collectively known as “proteins” and play both structural (muscle and connective tissue, skin, hair and nails) and non-structural (immunity, cell signalling and cognitive) roles in the body. When we eat protein (such a chicken breast or my favourite: Birthday Cake Whey Protein) our body breaks it down into the amino acids from which it was built (Figure 1). This provides your body with the raw materials needed to make the new proteins your body needs such as muscle tissue (which most of us want!) or structural components of the body (skin, hair and nails). Amino acids involved in protein synthesis are called “proteinogenic” but there are many non-proteinogenic amino acids that are still required for the body to function optimally – proving that there is more to amino acids than just making those gains! Assuming most people reading this are interested in the muscle-loving properties of amino acids, we’ll focus on that but remember that they also play a role in mood regulation, sleep and many other processes. There are 21 proteinogenic amino acids required by the human body. Of these, 9 are considered “essential amino acids” (see Table 1) as these are amino acids our body can’t make itself and must obtain them from external sources. In other words, to ensure you’re providing your body with every brick of the protein wall, you must consume adequate quantities of protein through your diet. This is easily done nowadays – especially when it also tastes like Birthday Cake. So now that we’ve covered the basics, let’s take a look at the famous branched-chained amino acids and see why they might benefit you and help you reach your goals. There are 3 branched chained amino acids; leucine, isoleucine, and valine which account for up to 33% of muscle tissue (I’d imagine I’ve grabbed your attention now, eh?) making them instant-besties to bodybuilders and powerlifters alike. They’re called “branched chained amino acids” simply due to their chemical structure – they’re a little bit more complicated than most amino acids! We obtain BCAA’s through our diet only, reiterating the importance of keeping an eye on that protein intake! Studies have shown that supplementation with BCAA’s during athletic performance may reduce fatigue and prolong exercise endurance by increasing the lactic threshold of your body. When we work out, lactic acid is produced which makes you “feel the burn” and eventually forces you to finish your workout. If this threshold is higher, your body can tolerate higher levels of lactic acid meaning you can train harder and for longer, giving you the best bang for your buck during your training sessions. When we train, we are breaking down our muscle tissue… Relax! This is supposed to happen because then the body rebuilds the muscle into stronger and bigger muscle tissue – which is most likely a common goal here. However, the body can only work with what’s available at the time and if you don’t have enough free amino acids in your bloodstream, you will limit the body’s ability to recover. By supplementing with BCAA’s you can ensure there are always enough free amino acids available to aid in the recovery process and reduce overall catabolism (the breakdown of muscle tissue). I know what you’re thinking, “I eat protein, doesn’t that give my body enough amino acids?” and technically, yes it does but remember that when you eat protein you also have to digest it before the amino acids can be used, a process that can take up to four hours. 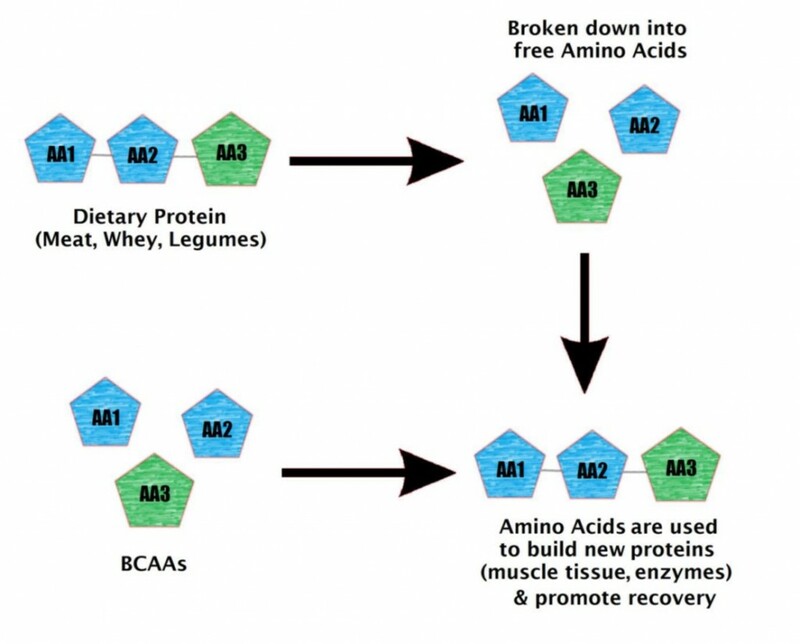 BCAAs on the other hand are instant sources of the most important amino acids for muscle growth and repair. Supplementation with BCAAs (particularly leucine) has been shown to increase the activity of enzymes and other metabolic machinery involved in protein synthesis, such as testosterone and mTOR (trust me on this one – that’s a good thing!). In addition, BCAA’s may also promote the synthesis of the machinery itself, meaning they not only promote an increased rate of protein synthesis but also the body’s ability to carry the process out! It’s safe to say that almost anyone can benefit from supplementation with BCAA’s – especially if you’re a professional or training more than five times a week because they aid in recovery and promote protein synthesis – a process easily stalled due to fatigue and lactic acid accumulation. They are particularly useful however when in a caloric deficit (i.e. eating fewer calories than you burn) where you either cannot afford to consume the extra protein required due to calorie restriction or simply due to the catabolic nature of dieting. BCAA’s do not count towards your caloric intake and so are a staple supplement for those dieting but as I’ve probably clarified already, they’re a great choice for anybody looking to maximise their muscular potential. They don’t come in Birthday Cake flavour yet, though – but we’ll deal with that! Michelle is a scientist, an athlete and a writer and she’s proud to have faced her demons head on and she’s beating them. In weight lifting she found an outlet to help change her life – and she’s loving it! Follow her journey with BULK POWDERS®. Which Amino Acids Are For You?